Empty trains, shortage of wagons, few locomotives, disastrously bad railroads. Although the safest, most comfortable and cheapest, our railway traffic is about to fall apart. Only the harsh reality – bad railway infrastructure, abolition of the already existing lines and absence of investments for normal functioning of this traffic remained from the empty political propaganda that in the past prompted the hope that the journey by modern trains would finally be facilitated. Is the destruction of this traffic intentional in order to provide better conditions for certain transport companies? Is it the carriers first, rather than the interests of citizens? What is behind the inability of the country to have normal railway traffic? A hundred years ago the Macedonian railways were much faster and much more frequent. Much more people and almost all freight traffic were by rail. However, the last nail in Macedonian railways was hit decades ago. According to the reforms after 2007, Macedonian Railways were divided into two parts, Macedonian Railways – Infrastructure, a state company that takes care of the state of railway and railway stations and Macedonian Railways – Transport, a state company that takes care of locomotives, wagons and other means of transport moving along the rails. Irfan Asani, from the Democratic Union for Integration, has been in charge of the public company Macedonian Railways – Infrastructure for the second term. Many investments for modernization of this traffic have been announced, but in reality the situation is different. “What we know is that the last reconstruction or extension was 45 years ago. For example, Kumanovo – Skopje to Kicevo we have a rail which satisfies neither P of the parameters for signalization and telecommunications”, Irfan Asani, the director of Macedonian Railways – Infrastructure says. The situation is far from pink in the Macedonian Railways – Transport, where Shaban Zendeli from the “Alternative” has been a director for a few months. He says: “We have a very outdated car park. If we take the locomotives as traction vehicles, their average age is 36 years. We have a lack of them. We have a very small number of locomotives which makes it difficult for carrying out everyday activities. As a number we have 58 traction vehicles, but 16 function. All the others have been out of service for a long time. An optimal number would be 40 locomotives to function. The last locomotive, as far as I remember, was purchased 25 years ago”, Zendeli said to us. The situation with the passenger cars or the traction vehicles is no better. According to the Business Plan of the “Macedonian Railways – Transport” for 2018, the company has 47 passenger cars, of which only 7 function. The situation with the freight wagons is the same. The company owns 1,311 freight wagons as property, out of which about 60% or 760 are out of service. The average age of freight wagons is 42 years. The bad condition in the railways is reflected in the number of passengers. According to official data, 467 thousand passengers were transported in 2017. Just for comparison – in 1986 the same company transported 6.8 million passengers, which indicates that the number of passengers in the railways has dropped almost 20 times. 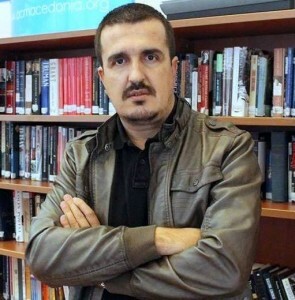 Shaban Zendeli, director of “Macedonian Railways – Transport” states. However, the habit of travelling by train is not lost in the surrounding countries. On the contrary, many more people travel by rail. According to the data gathered by SCOOPP-Macedonia, Bulgarian Railways transport about 10 million passengers per year, Serbia 7 million, Croatia 20 million, and Macedonia only half a million. The citizens of the Republic of North Macedonia have long been waiting for the realization of the promises for the revival of the railway traffic. They say this type of transport has much greater advantages. According to the survey of the Railway Regulation Agency published in the annual report for work in 2017, only 9% of passengers were satisfied with the service of Macedonian Railways – Transport. Bad conditions in railway companies mean a lost chance for a better transport. “We have material that is imported from abroad through the port of Thessaloniki for Cementarnica. The ship is about 50,000 tons. The truck transport and we as a railroad take part in that, because for 30 days as there is a time period for storage in the port, we are not able to transfer the entire cargo in Macedonia”, Zendeli explains. He adds that part of the situation will be ameliorated with a loan from the European Bank for Reconstruction and Development (EBRD). “Six0 passenger cars were purchased – the Chinese and 150 wagons with the EBRD project. Within this project, 4 locomotives are planned to be purchased with the EBRD loan. They are electric. At any moment we expect to get our first locomotive. 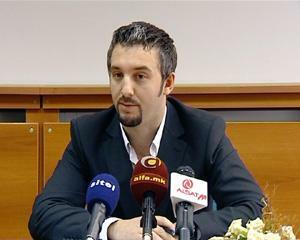 It is loaded in China, it is currently located in Korea, where various other goods are shipped to Macedonia”, he states. Some of the reasons for such catastrophic situations lie in the railway infrastructure itself. Macedonia has convincingly least tracks of all countries in the region. Slovenia has 60 km of railway tracks per 1,000 square kilometers, Croatia 50, Serbia 44 km, Kosovo 40, Bulgaria 39, Albania 31 and Macedonia on the very Balkan bottom with 27 km per 1,000 square kilometers. Since he has been appointed seven years ago, Irfan Asani, Director of Macedonian Railways – Infrastructure says that they have been maintaining the railways in minimal parameters. “We have reconstructed 30 km of track in two sections of corridor 10 where we do not include larger bridges or tunnels and also a signaling and telecommunication system. One 30 km section cost 10 million Euros, the second one 8 million Euros. But if we add tunnels, bridges, etc., we will reach other parameters. The grand total is perhaps a billion and a half or even more”, he says. The state’s interest in railways is none. They have forgotten that it is one of the oldest organized systems in the country, built 150 years ago. Nowadays the interest is only for the employees to be paid and have some social peace. There are no investments in the railway infrastructure. In Norway, according to Asani, the state covers the entire cost of the Infrastructure. Operators’ payment to Infrastructure is zero. “Kosovo’s railways have three times more resources than we get with 1,300 kilometers and they only have 300 kilometers. So Kosovo gets 10 million Euros for 300 km of track, and we get 3 million for 1,300 km of track. The price of access is the same and they have liberalization, and we do not. 0.3% of tax revenues should go for maintenance of the railway infrastructure”, he believes. Liberalization is just another indicator that the state is not interested in developing railway transport at all. So far there were attempts to introduce liberalization of freight transport in 2008 and 2009, but this did not happen, and in 2012 Nikola Gruevski’s government passed a law that only the trains of MR Transport can ride on Macedonian railways. “When you have an operator that is a monopoly, then it does not have to worry about competition. You will work as it is naturally goes and that is it. All countries in the region have more operators, including Kosovo. It joined the transformation system later and is now in front of us, although having 3 times smaller network” Asani states. He claims that prior to the stopping of liberalization, there were several companies that were interested in developing the railway transport in Macedonia.”There were companies from Slovenia, from the Czech Republic and other European countries, there were Austrian companies and there were also domestic companies that wanted to grow into operators” Asani adds. Zendeli from “MR Transport” says they are ready for competition in the sector. “In terms of competition, it is normal that we as Macedonian Railways Transport with these conditions we have, can deal with the competition. Then the same thing should be divided with others” he believes. Goran Sugareski, Minister of Transport and Communications, refused to appear in this documentary with a statement. “The development directions of the railway sector and the market liberalization are not within the competence of the Agency. If you have any other questions, please submit them to an email. I am not ready for a visual media performance and an interview”. The situation of employees in the companies is also disastrous. Thus, the railway system in the socialism in the country was connected by about 11,000 employees with all accompanying services. Now that figure is reduced only to the employees of “MR Transport” and “MR Infrastructure”. In both companies there are no more than 2,000 people. The situation in “MR Transport” is even worse. 30% of the people there have retired over the past 4 years. Just for comparison, there are 17,000 employees in the Bulgarian Railways. Bulgaria is 4 times bigger than Macedonia, but has almost 10 times more employees in the railways. Their railways transport 20 times more passengers than ours. This sight is still far away for the passengers in the Republic of North Macedonia. Somewhere in the institutional labyrinths, the plans for the railway traffic development remain only one beautiful story that is sold before every election.